There are two things you’ll need to setup in order to run Gui Scripts. First you’ll need to configure your client, then the system that you are connecting to. 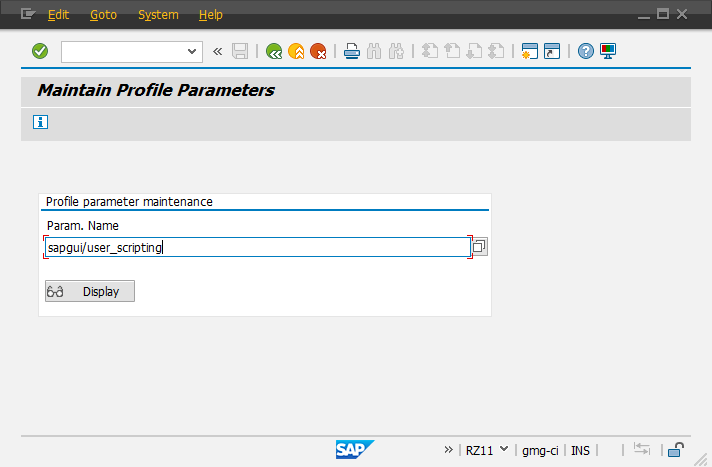 First, you’ll need to setup the SAP GUI Client to allow scripting on your local machine. The following procedure shows an example with a client running SAPGUI 7.30 on Windows. In the options panel of your GUI, you’ll need to select Accessibility & Scripting and then Scripting in the left hand column. Then you are presented with three checkboxes. UNCHECK - Notify when a script attaches to SAP GUI – Pops up a yes/no box when a script attempts to use the GUI. This is useful to have on because it give you a point to make sure you want to run what you are running. If you don’t have this on, the script will run without any confirmation. UNCHECK - Notify when a script opens a connection – This setting pops up a confirmation when your script connects to a system. I generally turn this off when I run a script that connects to the system multiple times to do what it does. Otherwise I leave this setting on. Once you’ve checked “enable scripting” you’re ready to run scripts on the client side. Next, you’ll need to check your settings on the server side. You can enable scripting by setting the profile parameter sapgui/user_scripting to TRUE. The value set using this procedure will be lost when the system is restarted. If the administrator edits the application server profile of the SAP System to include sapgui/user_scripting = TRUE, scripting will be enabled by default when the server is restarted. REMEMBER: ENABLING SCRIPTING IN PRODUCTION SYSTEMS IS GENERALLY A BAD IDEA. 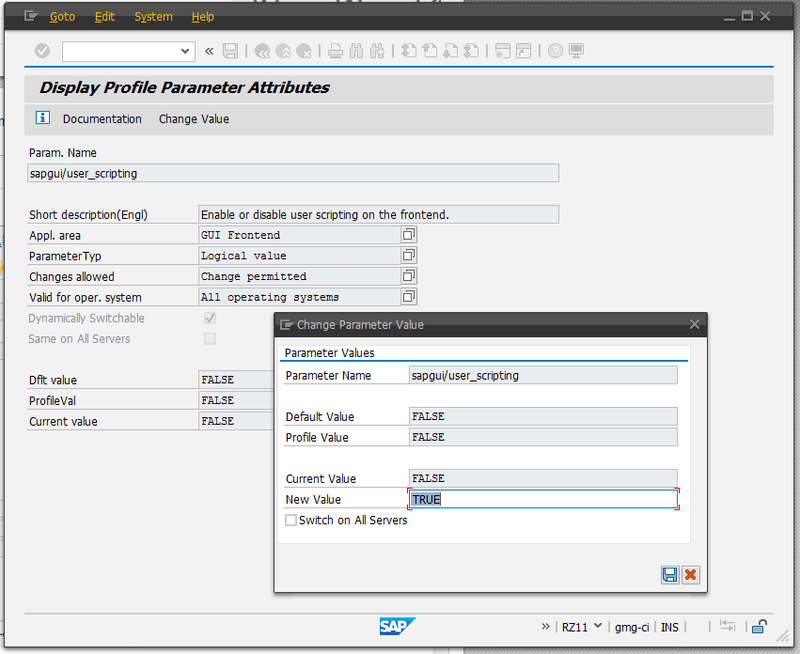 In the Display Profile Parameter Attributes screen, choose Change value. Enter “TRUE” in the new value field.